Some dogs are more sensitive to the cold than others. This usually depends on the thickness and length of your dog's fur, age, health, and weight. Temperature tolerance will vary with every dog, so it's important to learn the signs of drops in temperature which could lead to hypothermia. 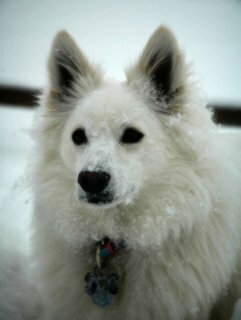 Some pet owners tend to forget about the risk of cold winter weather for their pets. Dogs that have short hair and small breed dogs are particularly sensitive to the cold. 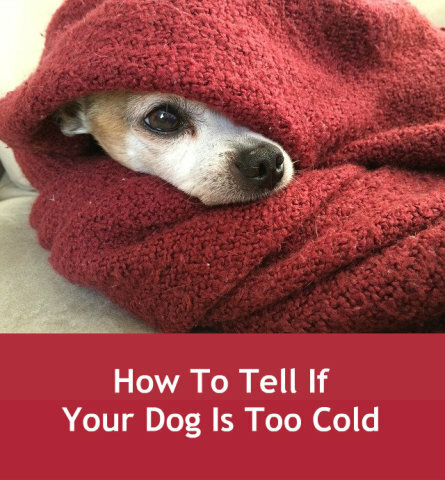 Also, puppies, older dogs and dogs with health conditions may feel too cold faster than other dogs. For healthy dogs with thick fur, if their hair gets matted or wet, their thick fur will offer less warmth and protection. Prolonged exposure to the cold can lead to hypothermia in some dogs. Hypothermia occurs when your pup's body falls too far below its normal temperature, usually below 99-95 degrees. Normal body temperature for dogs is higher than for humans so they should be at around 101 to 102.5 degrees Fahrenheit. Frostbite may also occur if your dog gets too cold. This happens when the body redirects blood flow to the most important parts of the body, often leaving the tail, ears, nose, paws, and legs at risk. Look for bright red or black coloring on any of these parts of the body. The most obvious thing to look at is how cold is it outside. If it is too cold for you to feel comfortable outside for even a few minutes, it is likely too cold for your dog as well. Your dog has fur to keep warm but you will likely have a coat on. If you can't stand being outside with your coat, hat, gloves and boots, it is most likely too cold for most dogs to stay outside.. Dogs react to the cold a lot like we do. If your dog is shivering or trembling, holding his tail close to his body, and trying to seek shelter from cold winds, he may be feeling cold. Shivering, shaking and trembling are ways that the body reacts to try to keep warm. Feeling your dog's ears is a good way to tell his temperature. If the ears feel cold, particularly around the edges, it might be time to take him inside and cover him with a blanket. You can also touch their body. If it feels cold rather than warm, it is likely your dog is too cold. If you dog looks like he is not enjoying being outside, he is likely feeling the cold. Your dog will walk slowly. Often, he'll appear hunched over and keep his tail close to his body as if he's trying to keep himself warm. If your pup is trying to hide behind or under objects during a walk as well, he's probably trying to seek shelter from cold winds, snow, or rain. If your dog is curling into a ball or he is hunched over with the tail tucked in and shivering, it's likely in an attempt to warm himself with body heat. If your dog is walking gingerly, or limping along the ground or through snow during the winter season, it's a sign that his paws are too cold. If your dog is uncomfortable, he may try to let you know by whining or whimpering or barking. If the dog acts in an unusual way, look carefully at his surroundings to make sure that he is not too exposed to wind or cold and that he has enough protection and sources for warmth in cold weather. If your dog looks agitated and anxious, consider why he may be feeling uncomfortable. also be a sign that your dog may be too cold and at risk of hypothermia.You need to get him inside and warmed up immediately. If your dog is barely moving and appears to have stiff muscles or seems to have difficulty breathing, you should go take your dog to your vet immediately. Remember to keep a close eye on your dog during extreme temperatures, If your dog is showing any of the signs for being too cold, take precautions to keep him warm, or bring him inside. If your dog needs to be outside for sustained periods of time or is an outside dog, you should consider getting him a good dog house to better protect him from the extreme weather. Here are tips on getting your dog a warm dog house. Also, it is very important to give him fresh drinkable water. You may want to get him a good heated drinking bowl. And of course, in the dog house, you should make sure he has access to a comfortable blanket and bedding that is off of the ground. And most importantly, please don't hesitate to take him to the vet if he exhibits any odd behaviors. Originally published October 2012 and updated December 2015. ‘Urban Animals,’ Human Interest TV Series About Non-Humans!